Researchers have discovered a new species of bacteria that causes Lyme disease -- the second species known to transmit the potentially debilitating illness in North America. The newly identified bacteria is called "Borrelia mayonii," in honor of the Mayo Clinic researchers who assisted with the discovery, along local health departments and scientists at the U.S. Centers of Disease Control and Prevention. The bacteria species was discovered after six people with suspected Lyme disease ended up with unusual results and researchers did extensive genetic testing to determine that the patients were infected with a newly discovered bacteria. Previously only "Borrelia burgdorferi" was known to cause Lyme disease in North America, according to the study published Monday in the medical journal The Lancet. Dr. William Schaffner, an infectious disease expert at Vanderbilt University Medical Center, said the findings show how new technology has helped advance our understanding of emerging infectious diseases. "This was likely a bacteria that was there all the time but because our scientific tests couldn't identify it," Schaffner said. "It was an unknown infection." The findings may help many others if they have suffered from a mysterious illness that turns out to be this new species of bacteria, Schaffner said. "The information will go out to doctors in the communities. They will start to ask for testing for this bug in a wider variety of cases," he said. "The clinical picture will mature as it goes on." 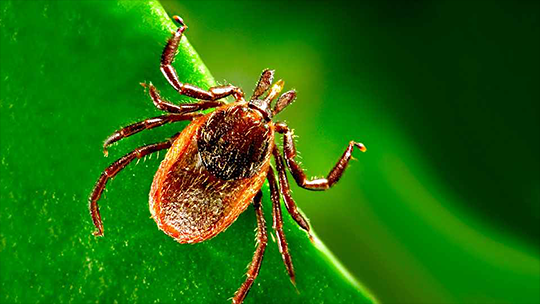 The new bacteria causes slightly different symptoms during the infection, including acute symptoms of nausea, vomiting and diffuse rashes instead of the "bulls-eye" rash associated with Borrelia burgdorferi-caused Lyme disease. “This discovery adds another important piece of information to the complex picture of tick-borne diseases in the United States,” Dr. Jeannine Petersen, a microbiologist at the CDC said in a statement Monday.The new bacteria is also spread by the black-legged tick or "deer tick," according to researchers. However, after extensive testing, researchers believe the bacteria is confined to the upper Midwest of the United States, with just six cases found out of 9,000 samples drawn in the Midwest of infected patients. They found infected ticks in two counties in Wisconsin, but believe there are infected ticks throughout Wisconsin and Minnesota. Researchers also saw no sign of the new bacteria after examining at least 25,000 blood samples from people with suspected tick-borne illnesses in 23 states other than Wisconsin.